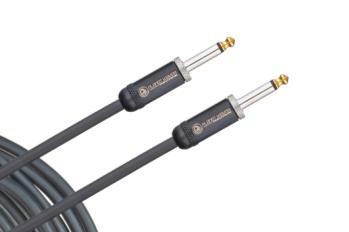 "American Stage cables are built to ensure that your tone comes through exactly the way you want it. The 15-foot length is ideal for medium runs, such as guitar-to-pedal board, and medium stages. Planet Waves American Stage Series cables are designed with audiophile quality wire, made in the USA, designed to reproduce the natural tones of your instrument with zero interference. The low 28pF/ft. capacitance is the sweet-spot for uncolored tone and the 22AWG oxygen-free copper conductor provides exceptional signal transfer. American Stage cables reject interference and avoid handling noise with 100% shielded coverage and 95% tinned copper braiding.